I've never been one for multiple bets! I suppose the lower strike rate puts me off and the general feeling that they are mug bets, loved by bookmakers. I've always known that if you have value bets that you multiply the value with a multiple bet, but I've never been tempted until recently. The reason I'm into them now is because a couple of the tipping services here have been using each way Doubles and Trixies to great effect. And it's not just Bookies Enemy that is exploiting these bets. The Racing Consultants know the power of the eachway multiple. If you want to be involved with bets like these the easiest way is to join one of these services and profit from their hard work. 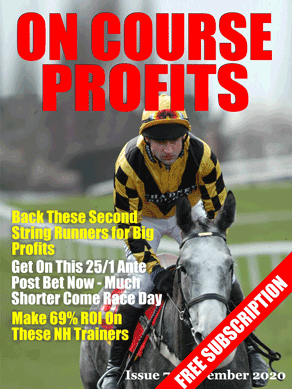 But if you don't like paying for tipsters then there is an excellent article in the February On Course Profit mag that explains how to do it for yourself. So last week I shared my new Odds On Jockey system for All Weather racing and since I posted it there have been three winners from four selections and a profit at industry SP of 3.25 points, so we're off to a good start. Today I'll run you through the equally simple Odds On Trainer system for the All Weather. So basically we are looking for horses that are running on the All Weather that start at 6/4 or shorter that are trained by one of the trainers I have listed below. These guys produced a 36 point profit in 2014 and are in form with their All Weather runners. I hope you had a little bet on Hernando Torres yesterday and got the 11/2 that was available when I mailed you. Even better than that I hope you joined Gary for the full Trixie! The other two selections both placed and overall 19.78 points were made by members to advised prices, with SP producing over 10 points profit on the day. Today I've snaffled you a selection from another top tipping service to see if I can repeat the feat. The Racing Consultants is the joint name of the team that is David Massey and Rory Delargy. These guys are proper old school form students and know the form book inside and out. Since they started sharing their tips back in June last year they haven't had a losing month. The last time James Ewart’s UN GUET APENS saw Sedgefield was in a handicap chase just over a year ago. On that occasion he jumped well and never gave his supporters a moment’s worry, coming right away from three out. He improved on that when beating the 130 rated Supreme Asset at Carlisle in April, which saw his rating go to 133 over fences. There have been excuses for two of his three runs since then, as they were over a trip that looks too far (and the cheekpieces he seems to need were missing on one occasion too), but if judging him on the run in between, when getting beaten a short head by Indian Voyage back at Carlisle off 132, it’s not difficult to see he’s well handicapped today back over hurdles on a mark of 128. With trip, ground and track all ideal, and the cheekpieces returning, there seems little reason why he shouldn’t run his race.